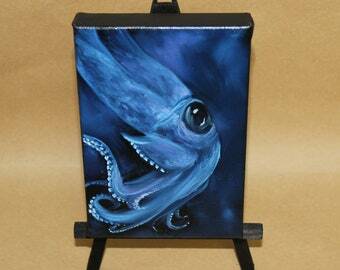 This listing is for the 6x6" original oil painting only (anything else in the photos is for size reference only). The painting was created in March 2018 as one of a series of seacreature paintings. 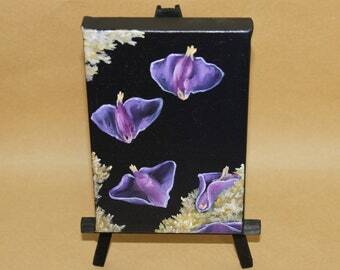 This painting is painted on a canvas panel, and comes with the 7x7" black wooden frame shown. The back of the frame is also shown; no additional hanging (or standing) equipment comes with this frame. 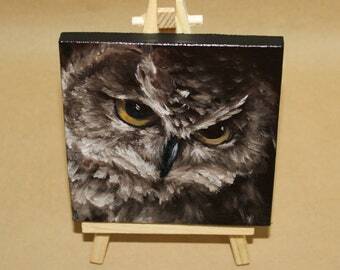 The painting will be signed on the back of the canvas panel and the back of the wooden frame. 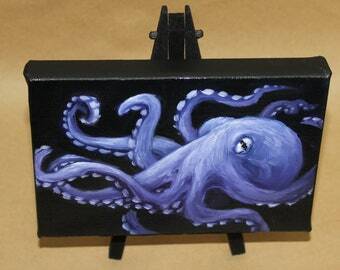 These adorable mini-paintings are a great size for a desk or small table and make great gifts. 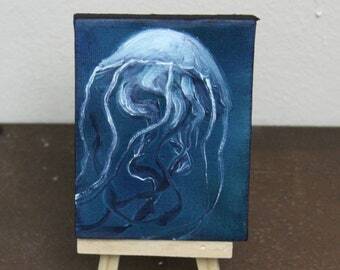 Mini-paintings are a great way to own original artwork when you can't afford - or have no room for - a large piece of art. 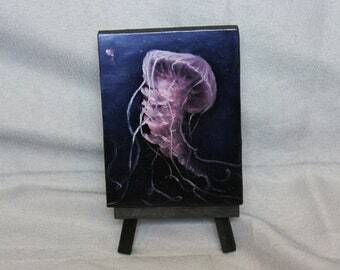 They're also a great way for me to test out new ideas, so let me know if there's something you'd like to see me paint on a mini-canvas! Art will be gift-wrapped. If you also want a message on the included gift note, please let me know at the time of purchase. Such a powerful but peaceful scene, this gives me an incredible feeling. I love this artist soooo much! Virginia residents must pay sales tax. MUST include tracking number with returns. Refund will be issued after item is returned to ScenesbyColleen. If item is not as shown/stated in listing or damaged in some way despite the care taken, please contact me as soon as possible to work it out. Shipping to United States residents only at this time (update: now worldwide!). Item will be packaged and shipped as quickly as possible after purchase. When you purchase a painting, it will be packed in appropriate packaging and sent out as soon as possible, currently through USPS. Lost or stolen packages are not my responsibility; please choose the appropriate insurance and/or delivery notification options available for your package if you are concerned (send me a message if insurance options are not available or listed in the item listing). I will follow through the steps for lost or stolen packages with the shipping provider, but I cannot guarantee delivery. I do not refund lost or stolen packages. 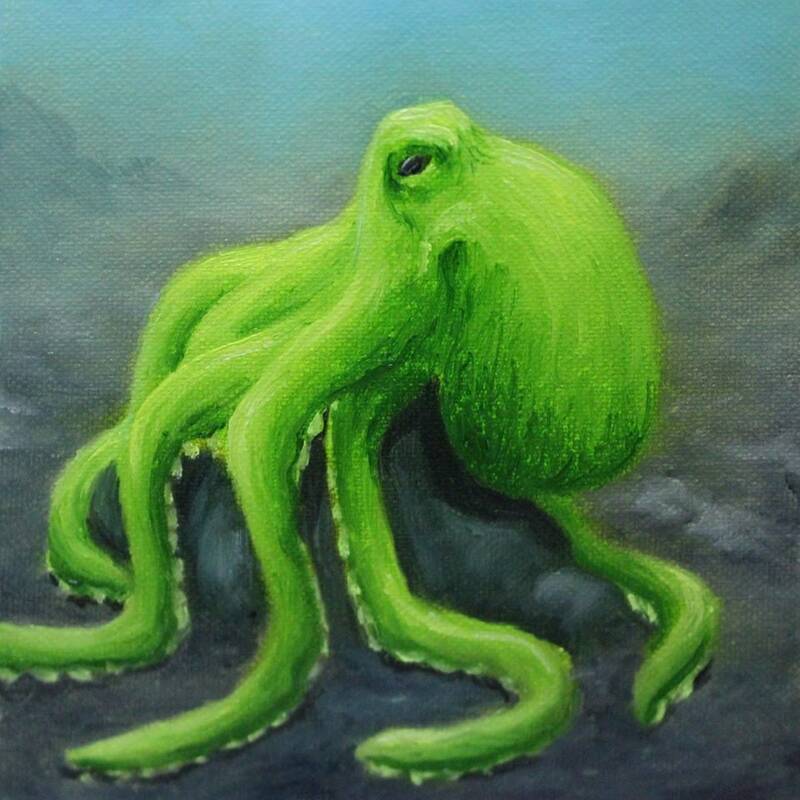 If you are interested in a custom-made painting, please let me know. My schedule for painting is limited, so please also let me know if there is a time frame involved so I can plan accordingly (it is easier for me if there is no hurry). 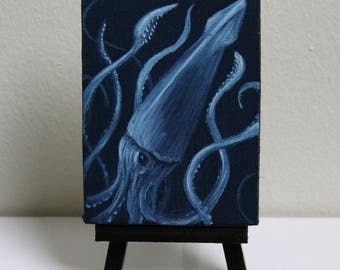 If there is a painting that you really love but do not currently have the means to afford it at this time, please send me a message. I have reserved items for many customers and I am more than happy to work with future collectors of my artwork! All Copyright of art displayed belongs to Colleen Woodward. Please do not copy, distribute, reproduce or use my work without my permission. Purchases of artwork do not entitle the buyer to reproductive rights.